By this point, there is no denying that content marketing should be an essential part of every brand’s integrated digital marketing strategy. Content enables brands to create a connection with current and potential customers that can also support many other digital marketing initiatives if optimized correctly. Since we’re all on the same page about content, the question many marketers are wondering is: what does the next iteration of content marketing look like? Try this on for size: 84% of worldwide consumers will take action based on the reviews and recommendations of trusted sources above all other forms of advertising (Nielsen). Based on that statistic alone, everyone reading this should have just had an “aha moment”. If consumers trust reviews and recommendations from sources that they trust, that means that you should be adding additional trusted sources outside of your brand to build credibility within your content marketing. TopRank Marketing has been tapping into our own online community, and connecting with influencers for a long time. 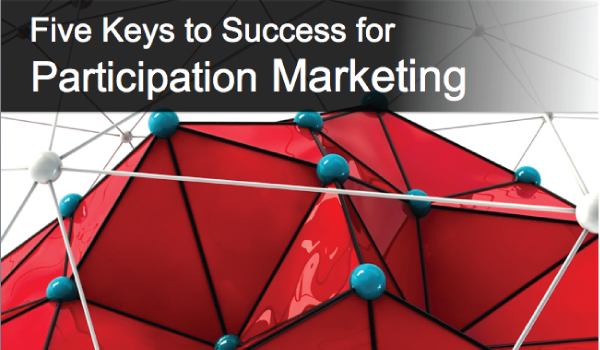 Based on this experience, we have prepared a handy guide that outlines the five keys to success for participation marketing for those of you that want to add more participation to your content marketing. We’ve also collected some great examples of participation marketing in action to help inspire you along the way. Story Planning: Understanding the unique selling proposition for the brand and how that story will be told through content collaboration is an essential first step for participation marketing. Activate Content Participants: Define and begin connecting with potential participants inside and outside of your organization long before you ask them to co-creation content. Co-Create Content: The opportunities to collaborate are only limited by your imagination and creativity. Amplify Content: Take advantage of the fact that you’ve co-created content with participants by making it easy for them to share. Performance Optimization: All content that includes participation from other resources should be optimized for people and search engines. When first endeavoring out on a content participation initiative, it can seem overwhelming. But, once you take the first step, you realize that participation can be incorporated into your marketing at varying levels. Below are some examples of simple and large scale ways to add more participation to your content. Dell’s IT Ninja – This is a community created website that includes over 7,000 software tips, 350,000 software titles and commonly asked questions. This website has approximately 500,000 visitors each month. TopRank Marketing’s Content Marketing Horror Stories – In the spirit of Halloween, TopRank Marketing reached out to three brand marketers and asked for their biggest content marketing horror story. In addition to sharing these stories, the team at TopRank Marketing created customized horror movie posters to align with each story. Intuit – Another great example is Intuit’s Small Business Big Game. Small business owners are asked to enter videos explaining why they want to win a commercial for their business during the Super Bowl. The people that submit are then invited to get lots of shares on their submission. Part of the program includes giving tasks to the businesses to answer questions about their small business. So, they are essentially micro-blogging information that can be useful to other small businesses that could use Intuit’s products. This program had thousands of entrants and millions of votes casted for the entries. If you’re ready to take your content marketing to the next level by including participants, then it’s time to learn and live the five keys to success for participation marketing. Below is an embed of the presentation that you can view here, or download from SlideShare. If you’re tired of explaining why you cannot create enough quality content or why content marketing investments are not showing a great ROI, then talk to the participation marketing experts at TopRank Marketing. Great ideas Ashley, thanks for sharing. I love the Halloween-theme content marketing pics. They’re great. I can see these ideas working well on Pinterest, Facebook and other image strong platforms, as well as blogs. Thanks for the ideas and inspiration. You’ve got me thinking. I say, these are very helpful tips. Having a unique content will get the people to read your blog. Planning is always important. Plan first before publishing your content. Thank you for this awesome article Ashley!